In this episode, medical anthropologist and global health expert Dr Shahaduz Zaman speaks to palliative care consultant Dr Nezamuddin Ahmad about a community project which delivers palliative care to people dying in the slums of Dhaka. The project, Compassionate Korail, was founded as a partnership between the Centre for Palliative Care (CPC) in Dhaka and the Worldwide Hospice Palliative Care Alliance (WHPCA). Dr Ahmad is Director of the Centre for Palliative Care at the Bangabandhu Sheikh Mujib Medical University (BSMMU) in Bangladesh. Dr Shahaduz Zaman is Research Fellow with the Wellcome Trust-funded research project ‘Interventions at the end of life – social, comparative and historical analysis to promote global improvement’. 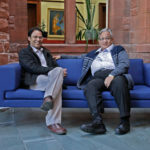 The project is being led by the Glasgow End of Life Studies Group, based on the University of Glasgow’s Dumfries Campus.